Coming soon - ComSciCon's 7th annual flagship workshop! The application period has closed for ComSciCon's 2019 flagship workshop. Stay tuned for updates after the event! Announcing the first ComSciCon for astronomers! ComSciCon AIP will be held at the American Center for Physics in College Park Maryland on September 23-24, 2019. ComSciCon is a series of workshops focused on the communication of complex and technical concepts organized by graduate students, for graduate students. 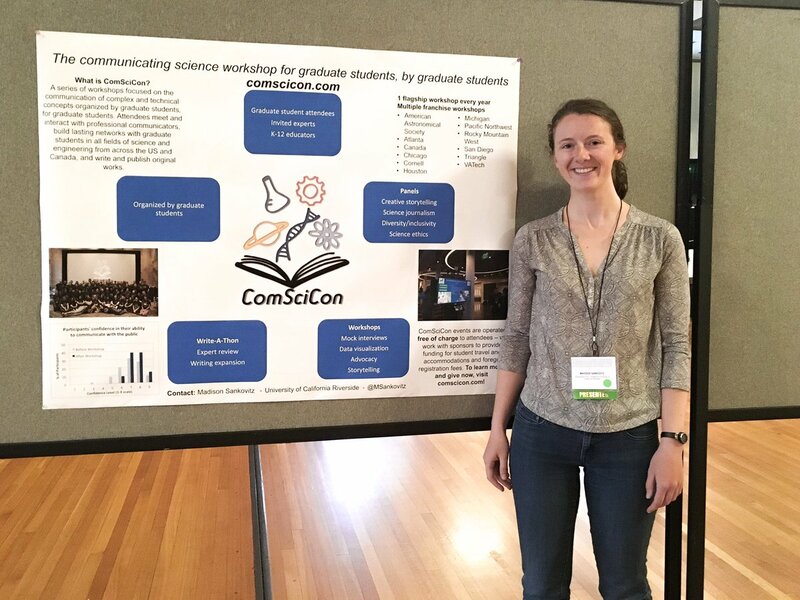 ComSciCon attendees meet and interact with professional communicators, build lasting networks with graduate students in all fields of science and engineering from across the US and Canada, and write and publish original works. ComSciCon's sponsors and patrons make it possible for graduate students to participate in our programs free of charge. Your donations support our work! Click here to find out how. Your tax deductible donation will be received by The Story Collider on behalf of ComSciCon. ComSciCon @LearnLoudly @UCSUSA @500wsDC @DMV_AWG @DistrictTrivia @WundergartenDC Ah yes -- weekdays are tough. Hope to see you at the next one! ComSciCon @LearnLoudly @UCSUSA @500wsDC @DMV_AWG @DistrictTrivia @WundergartenDC It's on a Thursday!